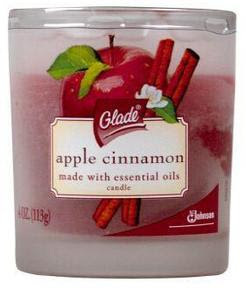 Glade's Apple Cinnamon candle...This is the perfect way to get your home smelling like the Fall season - Delicious scent and not perfumey at all. Stock up on these and use them all the way through the holidays - They are only $3.50 - $5.00 depending on where you go. Target has the best price. I like this candle way better than all of the other more expensive brands.